the ice cream and brioche bonus. if you were to buy an ice cream sandwich from one of the many street vendors selling ice cream from pushcarts in the philippines, you would not get what most people would expect, ice cream in between two cookies. rather, you would literally get a scoop of ice cream in a bread bun, sometimes the ubiquitous pandesal, but more often the sweeter, milkier monay (moh-nigh); after all, it is a sandwich--why shouldn't it be on bread? i have always preferred this type of ice cream sandwich over the cookie variety; cookies can be too sweet, and most importantly, with our tropical weather, the fast-melting ice cream is soaked up easily by the bread, with a minimum of fuss or mess. of course, the dirty ice cream variety is a cheap and cheerful street food that is mostly enjoyed by children, but it can easily be elevated into something more elegant with the choice of bread and quality of ice cream. oh, you know it's coming--yes, yes, i had some leftover brioche from my recent foray into brioche making, so you know i had to try it. if the brioche is fresh, there really isn't any need to do anything but split it in half and scoop up your favourite ice cream for the filling. 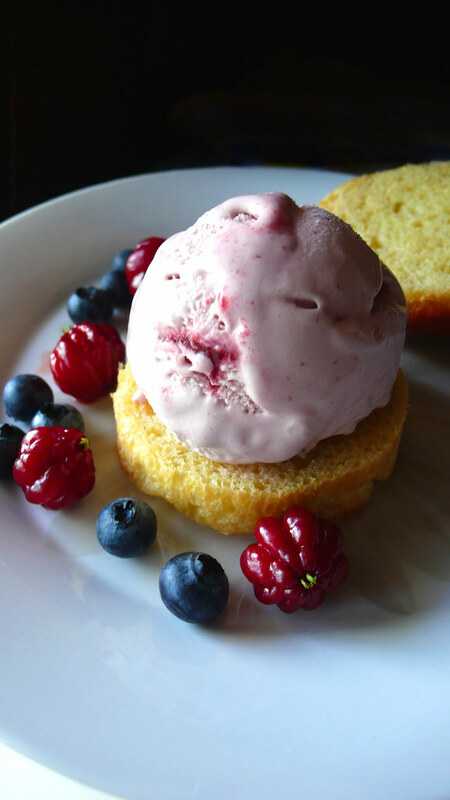 currently my favourite is häagen-dazs' summer berries and cream flavour, which is beyond smooth--like slipping between cool silk sheets, i tell you--and has a lovely balanced berry flavour, with a ribbon of tart raspberry sauce throughout. it is mercifully not too sweet (okay, it's a little sweet, but it's not cloying at all). this, combined with the rich brioche is like a decadent cream tea treat reinvented for the summer heat. lovely. 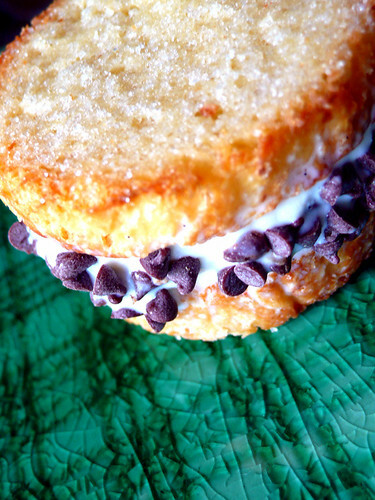 one of the great things about an ice cream sandwich is the portability factor--convenient to store, convenient to eat. a little toasting of some brioche rounds lightly buttered and lightly sprinkled with sugar created the perfect base for some vanilla bean gelato (also store bought), and a sprinkling of semi-sweet mini-chocolate chips. the brioche toasts were crispy on the outside, tender on the inside, and the intermittent nuggets of dark, rich chocolate were a wonderful foil for the heavily perfumed sweetness of the chilly vanilla cream. elegant in some ways, but still delightful for children of any age. the girl who ate doughnuts. ay, that girl. again, with the food! she really will eat everything, i think, one day. earlier this month, miss robyn reported on national donut day, and i was a little surprised at the ones she preferred, which i had previously found lacking. but that is me, and i have never been fond of doughnuts, although i feel like i should as they are, in theory, a wonder of the modern world. shouldn't deep-fried dough equal sweet, fluffy light poofie cakes with a tiny bit of crispness and some sort of fatty richness? it should, but i rarely feel like it does. most doughnuts i've tried do not actually taste like anything and act like vehicles (reliant ks, not mini coopers) for fat or sugar--they are stodgy, there is very little subtlety, and frankly, very little flavour. i have had a few excellent doughnuts before, so i knew it wasn't a lost cause. i prefer yeast doughnuts with some sort of filling or glaze over cake-type ones with flavours incorporated into the batter; since i was already working with brioche dough, i thought that this was the perfect opportunity to see if it would make as good a doughnut as i thought possible. however, i didn't think that the brioche recipes i had tried previously would work; the high butter content was a concern to me, as i thought maybe it would melt off too much in frying, or just burn up. so, the handy-dandy internets yielded this recipe that has a healthy amount of eggs and butter, which to me is an imperative. i had a lovely cinnamon-scented honey; on brioche it became even moreso--the silky, earthy, slightly musty amber blended well with the equally sumptuous and rich bread. 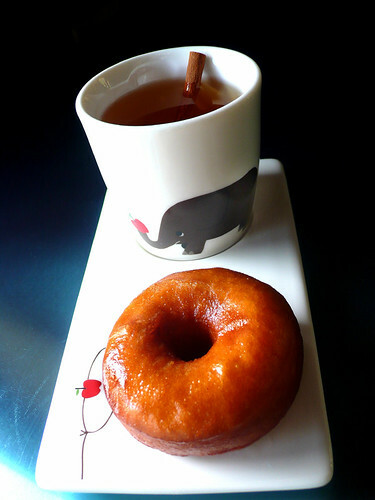 it was a natural match, so i decided to swap out the sugar in the doughnut recipe for honey. i didn't feel the need to compensate for the extra liquid that the honey would add as extra moisture in bread doughs doesn't have to hamper the final product as long as there is sufficient kneading. which, actually, is a LOT of kneading. i find brioche doughs to be somewhat difficult in that the eggs and butter can make it a sticky unwieldy mess; however, keep kneading and eventually it comes together in a beautifully golden-tinged elastic ball. yeast doughnut doughs, too, can be just as difficult to work as brioche, perhaps even more; at least with brioche i don't have to use a mixer to get a good dough (although it helps)--with a mixer, this doughnut dough took something like 30-45 minutes to get properly elastic, and smooth. that along with an overnight proofing time means it will take something like 11 to 12 hours to complete. despite these doughnuts not being something that can be knocked out on the spur of the moment, the work that must be done is pretty easy-going. yes, they are fun to make. 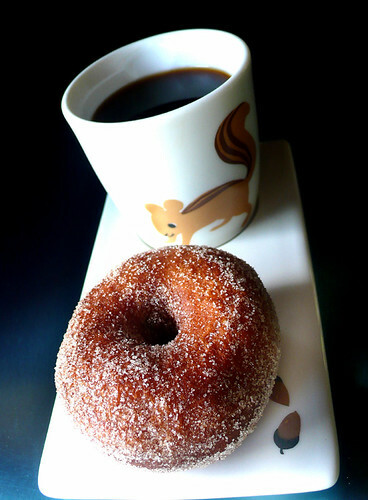 also, i thought the final product was well worth the effort; dusted with cinnamon and vanilla-bean infused sugar, or glazed with apple cider and more of that cinnamon-scented honey, these doughnuts were golden brown, airy, light, not too sweet, and tender. truly delicious, and packing more flavour than the ones offered at your average donut hut. the girl who ate mini-burgers. grilled sirloin beef mini-burgers seasoned with kosher salt and black pepper, served on homemade brioche buns with melted fresh mozzarella and a green pesto made with arugula (rocket), mint, roasted garlic, parmesan, walnuts and lots of olive oil. pheeee-yuw, that's a long description. i was inspired by roboppy's sliders, which you can read about on her tasty blog. there isn't a bouchon bakery nor its equivalent anywhere in a 1200 mile radius from me, so i was left to my own devices. the brioche recipe of choice: peter reinhart's "middle class" recipe (you can read about my earlier brioche adventures); this time, i baked the dough as rolls with the aid of well-buttered dessert rings to create a more dome-shaped bun. the arugula pesto recipe came courtesy of elise, the only modification was doubling the amount of raw garlic to one clove, and the addition of a handful of mint, mainly because it was there. although i added a healthy dose to the burgers, there will be plenty enough left to use in other dishes. like pasta. amazing, that. i didn't quite make the burgers as small as the bouchon ones seem to be, and they definitely weren't sliders as there was a fair amount of chewing involved. 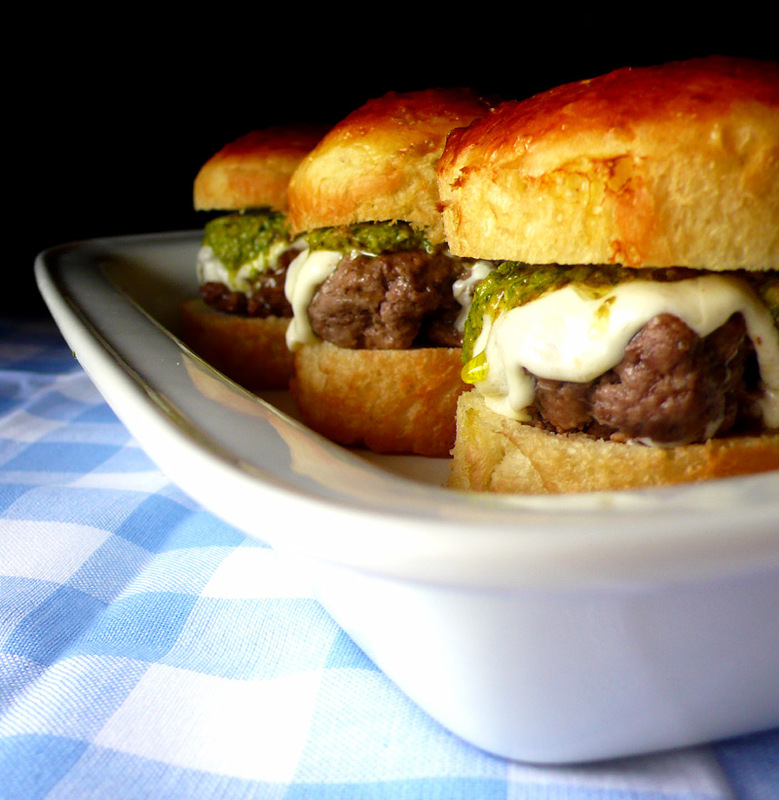 however, the buttery, sweet brioche was a good foil to the juicy, slightly salty beef and the pungent, peppery pesto. if i had to do it over again, i think i would look for a more flavourful cheese, perhaps something a little sweet and nutty like agnes dipesto jarlsberg or even comté. otherwise, a pretty good bet is that i'll make these again. 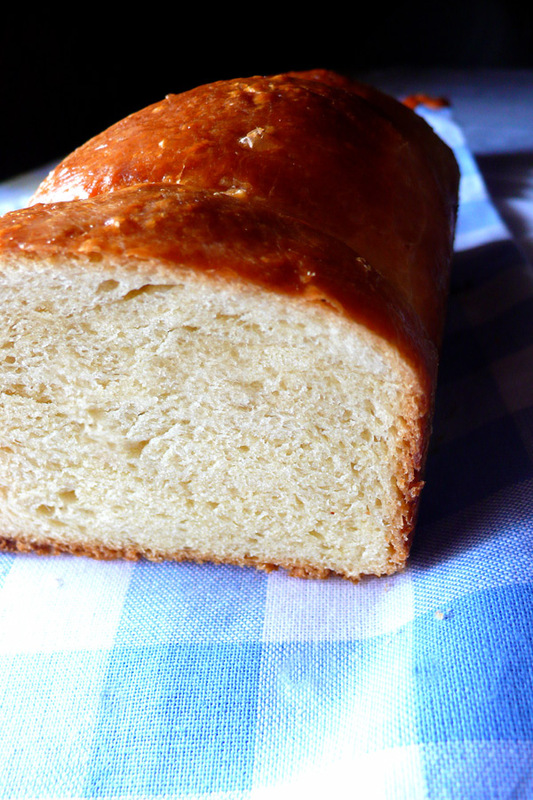 practice: it may not make perfect (yet), but darned if it doesn't make a better brioche than before. that, and a recipe that works for you. for me, it took three months, a dozen+ recipes, more dozens of unborn chickens and blocks o' butter later to find that this, this, this, and this recipe for the egg and butter-enriched dough equalled nope, nope, nope, and nope. why the problem? i suspect a number of things: my stubborn desire to hand knead everything, not kneading enough, kneading too much, warm hands, warm and humid working conditions, butter that's pretty good, but with a water content that's probably not ideal for brioche. life getting in the way. you know. after spending a small fortune on ingredients, though, it inspires you to do better for your buck. after a spectacularly failing performance with a gordon ramsay recipe and equally unspectacular jamie oliver one (i think it was an oliver. maybe. ), i found a bit of goodness with a peter reinhart recipe from (yeah, you know it) "the bread baker's apprentice: mastering the art of extraordinary bread." it's that book with the asian woman on the cover? who's not actually the apprentice in question? that one. also, i acquiesced and broke out the stand mixer, and decided to only work on the dough in the cool of night. reinhard's recipe for "the rich man's brioche" didn't work for me no matter what the weather, maybe because of the high fat content. however, the "middle class" recipe with less butter and eggs did. it made a nicely crumbed, moist, buttery loaf that would have been fine sliced up on its own, but the reason why i wanted to work on brioche was because of all the tasty things one can do with it. 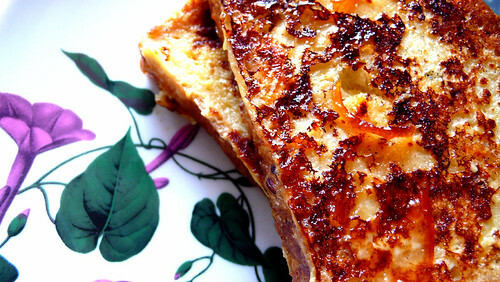 one of the first things i knew i had to try was umami's beautifully golden marmalade french toast, flavoured with vanilla bean and a healthy glug of orange-flavoured liqueur. very simple to make, albeit with an agonizing overnight refrigeration that makes it all the more tasty, and all the more tempting. i also made some lovely rolls for sandwiches, glazed with egg and sprinkled with just a tiny bit of kosher salt. 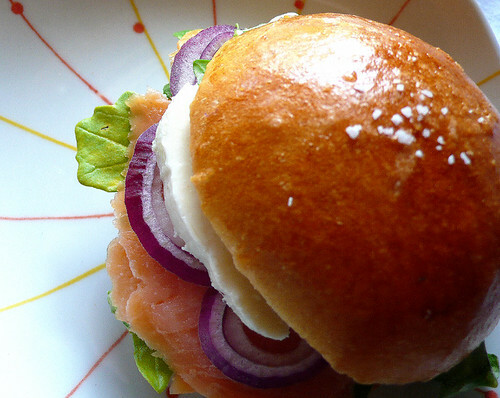 smoked salmon, fresh mozzarella, red onion and arugula make a fine combination on the sweet and tender bread. great for a meal on the go. 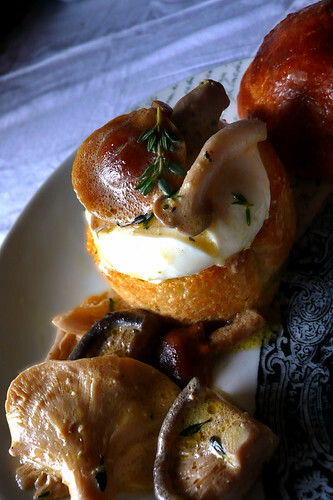 however, if you have the time to stay in, i more than recommend this decadent version of mushrooms on toast: a toasted brioche roll topped with poached eggs and a buttery melange of a variety of mushrooms sautéed in half butter, half olive oil, along with finely minced garlic and fresh thyme, then finished with a drop of heavy cream and a splash of cognac, some sea salt and freshly ground pepper. 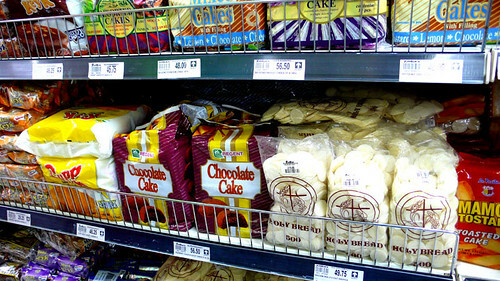 they sell communion wafers at rustan's supermarket in makati. you can find them next to the chocolate cake. 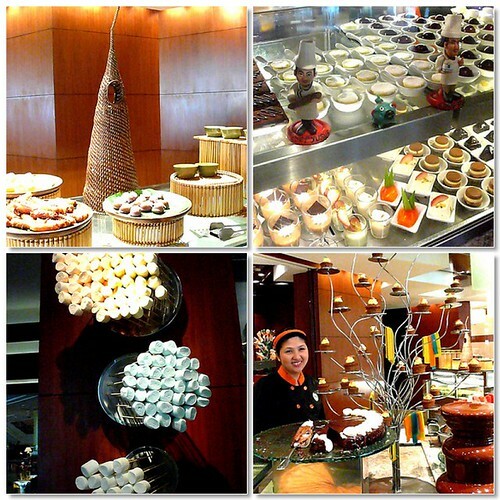 manila: revisiting circles at shangri-la. 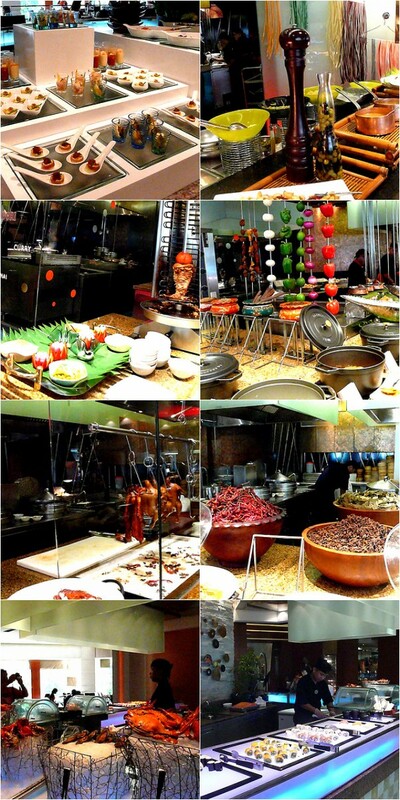 the first review still pretty much sums up how i feel about buffets (necessary to end the "what are we going to eat" question when in a large group), and my general feeling about circles at the shangri-la hotel in makati (great service, fantastic plating, nice atmosphere). my latest visit there changes my opinion only in that i think overall the food has improved, which can only be a good thing, right? truthfully, my stomach can't hang with the mish-mosh nature of buffets--a little bit of this and that means a lot of trouble later--so as far as mains go, i stuck with the indian station, which was very, very good. the butter chicken (makhni), veggie curry, lamb vindaloo, and spiced basmati rice were excellent, the naan and chapati very good. i did not venture into the other stations available: salads, soups and appetizers; italian, with a variety of pasta and sauces; a carving station with a chunk of meat, probably beef; schwarma--lamb, i believe--with freshly baked pita and all the condiments; chinese, with roasted duck, chicken and pork, dim sum, and stir-fried items; the sushi bar and cold seafood bar. next time. by far the biggest and most populated station is desserts; it is wonka-ish in scale and selection. 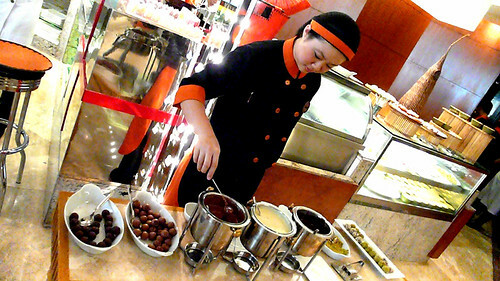 there are local desserts like banana turon (fried banana spring rolls), native rice cakes, sago at gulaman (sweet tapioca and gelatin), and ginataan (coconut milk stew); a vast variety of bite-sized cakes, pies, mousses, and puddings; a few hot dessert options like bread pudding and strudel; an ice cream and halo-halo (preserved fruits and shaved ice) station; a small but interesting variety of sugar-free desserts; a fantastic pop-art wall of marshmallows on skewers to dip into the chocolate fountain, which sits next to an imposing but enticing cupcake tree, adorned with multicoloured house-made fruit leathers. there was also a young woman hand rolling chocolate truffles: a choice of either dark or milk centers were dipped in warm chocolate--dark, milk or white--then gently rolled into either crushed almonds or pistachios. any combination you decide on would work, i reckon, as the chocolate was a much higher quality than i had expected. however, the one thing that garnered my attention the most was the candy cosmetics counter. not actual makeup, but candy and chocolate facsimiles in real cosmetics packaging: fruit-flavoured water "cologne" spritzes, viscous fruity "lip" and "body" gels, creamy white chocolate compacts and lipsticks. there's something quite girly and appealing about them. and they don't taste that bad, either. 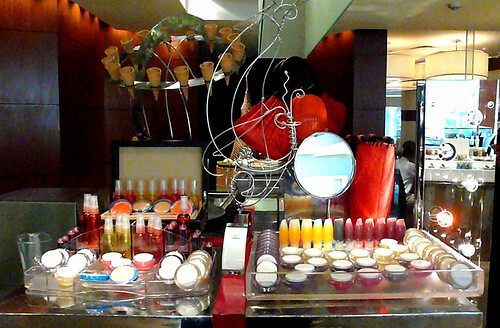 even though the counter is within the buffet, you must purchase the fakeup separately. 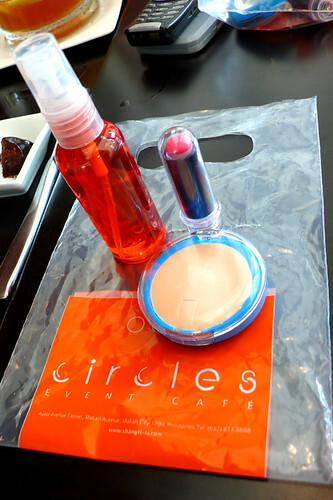 (if you buy them from the bakery, you get a full set and a lovely orange canvas makeup kit). however, there was a young woman in go-go boots and a white trenchcoat looking much like a department store makeup lady loitering by the stand, passing out full-sized samples. although i really wanted the mango body gel, i was pleased enough to get a strawberry spritz, berry-ish lipstick, and white chocolate compact. so, yes, circles still pretty good, definitely a top option as far as buffets go. the price is still quite steep for the average pinoy, but possibly worth it if you have a large appetite, want quality selection, or have a special celebration.